With their unusual shape and beautiful shimmering scales discus are widely admired, but many aquarists are nervous about keeping them because they have a reputation for being difficult to look after. In fact, so long as you take good basic care with water quality and provide them with plenty of space, discus can thrive in the aquarium and can prove delightful fish to keep.Despite being members of the cichlid family, discus are best suited to soft, slightly acidic water. Discus are largely carnivorous by nature, though they can benefit from eating some vegetable matter for roughage. They are quite vulnerable to infection, so you should supply them with live food only if it comes from trusted sources - brine shrimp are usually the safest option. Fortunately they can do well on a diet comprised exclusively of flakes and/or pellets. They enjoy frozen meaty food and also small pieces of roast beef and chicken, so you can share your own dinner with them. Sexing discus can be difficult, as there are no obvious differences between males and females - your best bet is to observe the way they interact with each other. A pair of discus who are ready to breed will select a territory within the aquarium and begin to defend it from other fish. However, it is best to transfer them to a separate tank for breeding. This tank should contain plants and vertical rocky surfaces for egg deposition. Change a small amount of the water in the breeding tank every other day and increase the supply of food. There is no need to remove the parent fish after eggs have been laid. 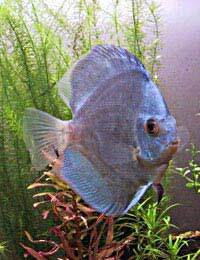 Both male and female discus are attentive parents and will guard and tend to the young. They'll even exude a special mucus which provides food for them. If you keep the parents in good health, they'll take care of everything else.